Sprint Nextel has been widely criticized after their October 7th 4G strategy conference, where the company outlined an expensive and complex shift to LTE, and away from their current 4G WiMAX provider - Clearwire. The company added more confusion to the strategy by announcing they had signed a "memorandum of understanding" (MOU) with Clearwire to cooperate on development ot TDE-LTE. It was against this backdrop that Sprint CEO Dan Hesse responded to warm applause as he began his keynote presentation at the company's Open Solutions Conference (OSC) in Santa Clara on November 3rd, saying "I can tell I'm not at a shareholder's meeting"! Hesse started by talking about the company's view of their brand, stating "what we really stand for is simplicity and value". He emphasized Sprint's goals of simplifying the customer experience, and also simplifying the core business through the "Network Vision" strategy to build one base station platform that integrates multiple networks and frequency bands. Success of the latter strategy will be critical to deploying an LTE architecture that may include as many as four different air interfaces; Sprint's 1.9 GHz for FD-LTE, LightSquared's hybrid satellite-terrestrial 1.6GHz FD-LTE, redeployment of 800MHz, and Clearwire's 2.5-2.6 GHz TD-LTE. Hesse acknowledged that concerns for the $10B expense of Network Vision are partially to blame for depressing the company's stock price, along with subsidy expenses for bringing on Apple's iPhone that will lower projected earnings through 2013. While many investors are only looking at the short-term, he said, "we want to be the best wireless company" and "you can't run your company based on what Wall Street is looking for this quarter". Sprint has accelerated the development of Network Vision, which Hesse said will benefit both 3G and 4G services. The company expects to cover 250M POPs with LTE by the end of 2013, with half of that number by the end of 2012. This is equivalent to a two-year reset from the company's previous Clearwire strategy, in which Hesse had earlier declared 2010 as "the year of 4G", with 120M POPs that were to be covered by WiMAX by the end of that year. Now, Sprint WiMAX devices will be sold only though the end of 2012, with a commitment for support through the end of customer contracts. At Sprint's OSC, Hesse described how the LTE ecosystem is poised to become larger than WiMAX, providing a benefit from the scale of a common 4G standard throughout Europe and North America. With the MOU to develop TDD-LTE with Clearwire, Hesse said that Sprint will be able to leverage the best of both worlds, since TDD-LTE in China and India may eventually be an even larger market than FDD-LTE. He said that the two companies first had to work out the network hand-off architecture, and now need to develop a commercial agreement and a handset technology roadmap. Regarding spectrum hosting, such as the 1.6GHz LightSquared LTE band, Hesse expressed the hope that other owners of unused spectrum would see the advantage of utilizing Sprint's Network Vision, rather than deploying their own "greenfield" network. In response to a question from the EE Daily News on how Sprint will go to market with multiple LTE bands, Hesse said we can expect to see both multi-band devices, and devices dedicated to a particular air interface and service. 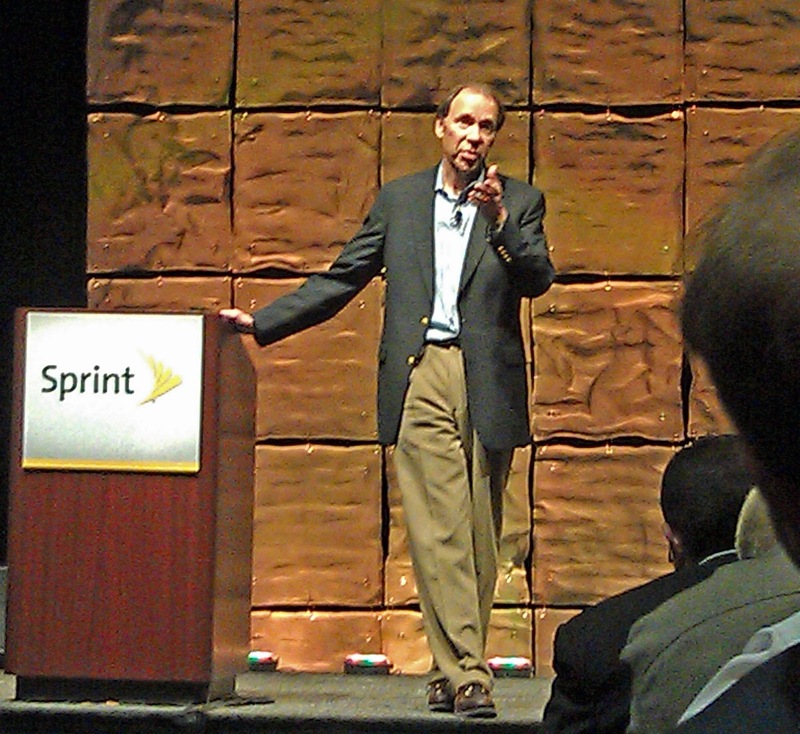 In 2012 Sprint will have dual-mode CDMA/LTE handsets. Going beyond the initial 1.9GHz LTE offering, Hesse said that it is possible that Sprint will offer devices with chipsets that support both 1.6GHz from LightSquared and 1.9GHz. Breaking down the frequency bands into low/medium/high, Hesse said this offers Sprint maximum flexibility. The low 700-800MHz band is good for building penetration, while the high 2.5GHz Clearwire band is great for "tonnage". The PCS 1.9GHz spectrum is very efficient for high volumes but Sprint's plan over time, Hesse said, is for a seamless hand-off from low to medium to high for maximum coverage and the best user experience. LightSquared CEO: We want to be the DUMBEST wireless broadband pipe.